*See further discussion at The Center for American Progress. In March 2014 CO2 Scorecard published a research note examining the role of US coal exports in global CO2 emissions. It generated a bit of buzz and a report on Climate Progress, eventually catching the eye of AP reporter Dina Capiello. On July 28, Capiello published a comprehensive report on coal exports and CO2 emissions, citing CO2 Scorecard and a number of respected, high profile climate policy analysts. Indeed, climate policy analysis is complicated, but the research presented as CO2 Scorecard's counterpoint does not pass muster. An open letter to Fowlie and Revkin follows. Greetings from CO2 Scorecard. We are writing regarding your respective recent blog posts (Berkeley & Dot Earth) that compare our analysis of CO2 emissions from the US coal exports to a forthcoming paper by Prof. Wolak at Stanford. Putting it in comparative terms, you both point out that our analysis concludes that global CO2 emissions would increase due to US coal exports, while Prof. Wolak’s analysis suggests the opposite—that export of US coal would actually cut net emissions. We at CO2 Scorecard welcome debate—however we are little mystified that you both went ahead and wrote blog posts comparing our analysis, which is publicly available with full details, to an analysis that is yet to be published. This limits our ability to provide detailed and specific comments on your blogs or on Prof. Wolak’s study. Your blogs seem to present a counterpoint to our analysis, though there is no real way for readers to see exactly what it is in Prof. Wolak’s economic model that generates his results. Based on what little we understand of his study (from a December 2012 presentation), we don’t think Prof. Wolak’s results are at all plausible under real-world conditions, and we see a danger in comparing them to our results. The point-counterpoint approach to climate policy reporting creates a false balance that confuses readers, and we are very keen to contribute clarity. When Prof. Wolak’s study comes out we hope to provide a proper critique. However, since your blog is out, we want to share some preliminary reactions to the issues you raised. Our assessment, at this point, is based on the best available information on the forthcoming study. Our investigation of the coal exports question suggests that the results that Prof. Wolak reports are feasible only under aggressive and highly unrealistic assumptions. You have already cited one—that demand for coal in China is inelastic, which may reflect the common view that China's entire electricity supply is determined by the central government’s five-year plans. In other words, the Chinese energy target follows the GDP target irrespective of the price of coal. But as NRDC energy expert Ralph Cavanagh pointed out at a Stanford conference featuring Prof. Wolak’s preliminary results, if an entire country’s demand for electricity is inelastic, that would wipe off a big chunk of the work in the field of fuel competition in energy economics. Even if Chinese coal consumption were determined only by the five-year plans, and not prices, Chinese central planners would observe that the coal supply has increased due to the US exports and could increase further planning accordingly. On the margin, the availability of more U.S. coal should make it easier for the Chinese to consume more—which, in turn, would increase global emissions. Nevertheless, Prof. Wolak admits that his model assumes U.S. coal export capacity has no effect on future Chinese coal consumption. Additionally, when US coal displaces coal from Indonesia or Australia—the primary sources of internally traded coal in the Pacific region—that doesn’t mean that Indonesian and Australian coal goes unused. Especially in Indonesia, where the economy is growing and the need for power is increasing, any displaced exports would free up the Indonesian government to build more domestic coal power plants. India also needs more electricity and sees coal as an increasingly cheap option as global supply rises, and there might also be increased consumption in other major coal importers, like Japan and South Korea. Does, Wolak’s model assume that Indonesian coal displaced by the US exports remains in the ground, as he assumes for Chinese coal? Once this implausible assumption is relaxed, Wolak’s results are likely to change. Wolak’s assumption of gas to coal switching in the US is also determined by assumptions in the model. Without accessing his full paper, it is unclear how much US coal he assumes would move from the domestic power sector to the Chinese power sector. That would depend once again on a pile of assumptions that drive the price differential with the Chinese import price. 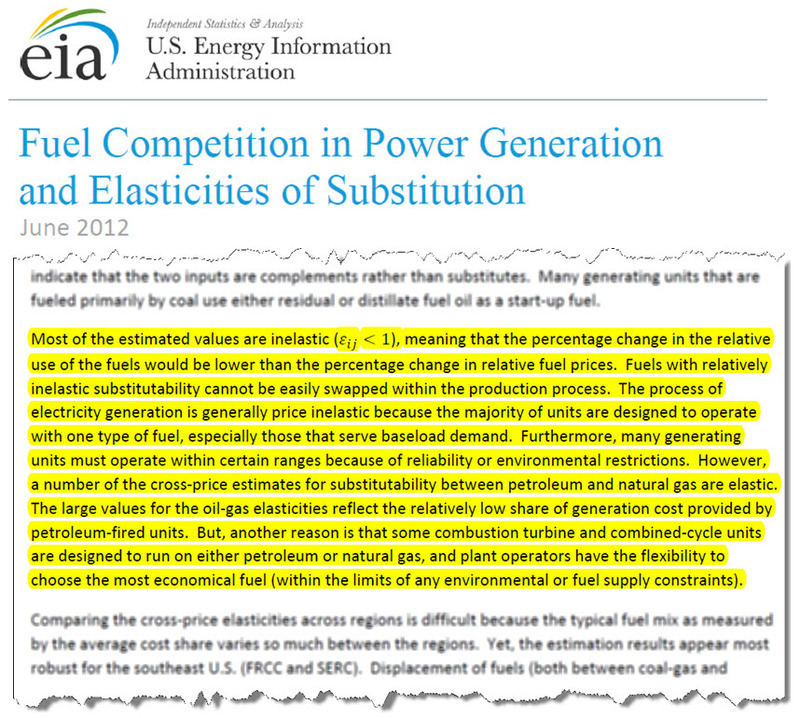 But, unlike China’s nationwide energy usage, the gas to coal substitution within the U.S. power plant fleet is rather inelastic (see the US EIA's 2012 report-pg 11/the related text in supplemental exhibit of this note--added on 6-Aug-2014). Indeed, the relative price of gas-to-coal has to fall significantly for a meaningful fuel switching to occur and for CO2 emissions to reduce; this means that increased U.S. coal exports would have to exert a significant upward pressure on coal prices to drive increased coal-to-gas shifts in the U.S. power sector. But the magnitude of the required change is larger than many appreciate. In a note we wrote in Aug 2012 we showed that a 10% reduction in the price of gas relative to coal cuts CO2 emissions by only 0.9%. The result was reaffirmed in a July 2014 paper by the RFF researchers, who confirmed that their estimate of the fuel-switching from coal to gas was identical to CO2 Scorecard’s (see their Table-6 / pg-32). The bottom line here is that the coal-to gas shift is rather inelastic and it is not clear how much of coal that shifts to China would actually be replaced by gas in Wolak’s model. Once again, we would have to look into his model to see exactly how this situation is modeled and what types of assumptions are made. Perhaps most problematically, Wolak uses a spatial equilibrium model of the world coal market for his analysis, which was originally created by Prof. Kolstad in 1983/84. 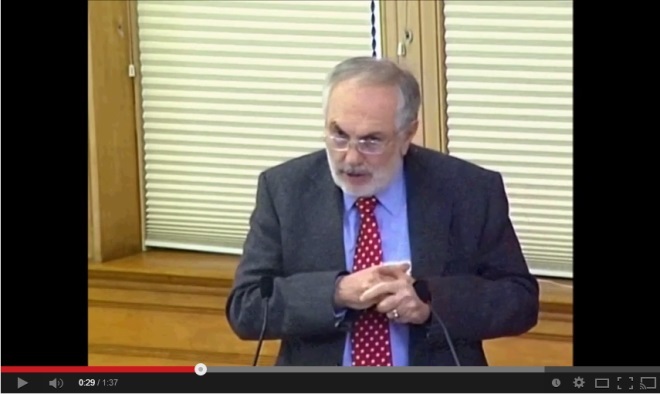 Prof. Kolstad commented on Wolak’s presentation at the conference in Dec 2012, pointedly telling the audience that the equilibrium model is terrible for forecasting the shipment of coal between countries (see the video clip below). This is a key number, and if it cannot be trusted, it throws the entire result into question. Of course, all research is built on some assumptions—and ours is no exception. We have two aspects to our note that we believe remain true, despite the issues you raise (and by implication, those raised in Prof. Wolak’s work). First, we want to provide a good accounting of CO2 emissions from all US coal including exports. The assumption here is minimal—we emphasized that coal-to-gas substitution gives us a savings of approximately 0.5 tons/MWh, but each ton of exported coal increases CO2 by 1 ton/MWh. As a result, exporting only half of the steam coal displaced by natural gas would offset the gains in the US CO2 inventory from fuel switching. The second aspect considers whether US coal exports are adding to global CO2 emissions. Our core assumption is that as the demand for coal increases in Asia’s growing economies, any increase in supply from the US puts downward pressure on the price and meets some of that demand. Thus, US coal exports both contribute directly to global CO2 emissions and are likely to induce additional consumption via their effect on Asian coal import prices. Even when some of the US coal displaces exports from Indonesia or Australia, in the second order effect, the displaced coal from these markets is unlikely to remain in the ground. It is much more likely to increase the supply in other markets—either for domestic consumption in those countries, or other export destinations like India, Japan, and South Korea. This assumption was partially borne out in this week’s headlines – Australia just green-lighted a US$ 15 billion coal mine, railway and port to export coal to India. When the US encourages coal exports, it sends a signal about the long-term acceptability of coal in international markets, motivating Indonesian and Indian governments to lock themselves in for more coal fired generation. Finally, we note that our work is transparent and publicly accessible. Like any calculations, ours rest on assumptions. On the basis of Prof. Wolak’s early descriptions of his coal model, however, we believe our assumptions are far more plausible. Indeed, several of Prof. Wolak's assumptions run contrary to some of most basic tenets of energy economics. So the bottom line is simple—one way or the other increase in the US coal exports would ultimately add to the global emissions. And it is just a bad idea for the US coal to contribute to increasing the global supply of coal. Given all these unknowns and many more, it is pre-mature to compare our findings to Wolak’s. By rushing to present it as a counter-point, you have jumped the gun. We are sure to have many more comments and look forward to a spirited discussion on this issue when Mr. Wolak’s study is publicly available. We are thankful to Danny Cullenward, a Philomathia Research Fellow at Berkeley and Jonathan Koomey from The Steyer-Taylor Center for Energy Policy & Finance at Stanford for their valuable insights on this issue. All the views and opinions expressed above should be attributed only to the authors and the CO2 Scorecard Group.